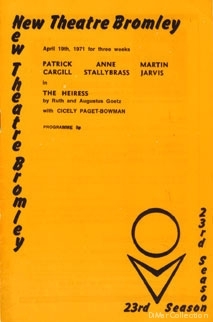 Productions may come, have their appointed run, and fade from the proscenium of the New Theatre, Bromley, but it will be a long time, I predict, before a future show tops “The Heiress” in the quality of its acting, production and staging. The play, by Ruth and Augustus Goetz from the moving Henry James novel, “Washington Square”, is a first-class piece of theatre - and one of my favourites - and the cast assembled by David Poulson could hardly be bettered. From the well-trained parlour-maid (Elizabeth Moorefield) to the principals, father and daughter, each player slots into his or her appointed characterisation with precision and a perfection not often seen. And the superb setting, designed by Paul Mayo, is so splendid and so authentically detailed that it was not surprising that it drew a long round of applause. Set in a wealthy doctor’s house in 1850, the elaborate costumes are delightful, complementing and enhancing the magnificent parlour of Dr Sloper. And what a wonderfully expressive Dr Sloper Patrick Cargill makes, meticulous in every move, every nuance. He has dignity and a commanding presence, so essential for the patriarchal doctor, and can hold a pause and the audience with it, for longer than most actors today. Opposite him as the some what gawky and unloved daughter, Catherine, is Anne Stallybrass, splendid in her absolute command of the role and its requirements. The timidity, the embarrassment in company, the inability easily to express herself, all came over with the consummate ease of an accomplished and highly talented actress. And behind the barrier one sensed the imprisoned depth of feeling and sensitiveness of the frustrated young woman well endowed with money, but no poise. As her avowed lover, Martin Jarvis gives a sterling portrayal of impassioned sincerity which completely deceives the heiress, Catherine, and only occasionally does a gesture, a pause, a query or an expression betray his concern for the monetary stake which is his prime concern. Cecily Paget-Bowman is the fluttering sister of the doctor, well meaning, and kindly, but no match for the penetrating insight of the doctor. 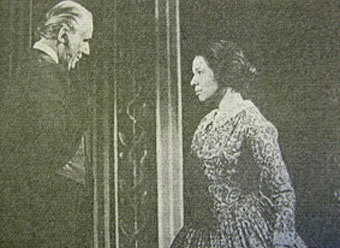 Barbara Ogilvie, as Mrs Montgomery, on the other hand, is not to be caught out or trapped by the doctor’s searching questions, and leave him unsatisfied on certain aspects of his prospective son-in-law’s character. A nice cameo, this. The smaller parts are exceptionally well acted and match the standard of the principals. Margot Thomas is the medico’s other sister, Elizabeth, Jan Francis his niece and Alan Leith her fiancé and later her husband. The lighting, with one or two minor first night slips, is excellent and the classical entr’acte music suitable and pleasant. But why is Catherine’s travelling bag, supposedly full of clothes, not heavier so that when she drops it it does not bounce as though half empty - which I suspect it is?